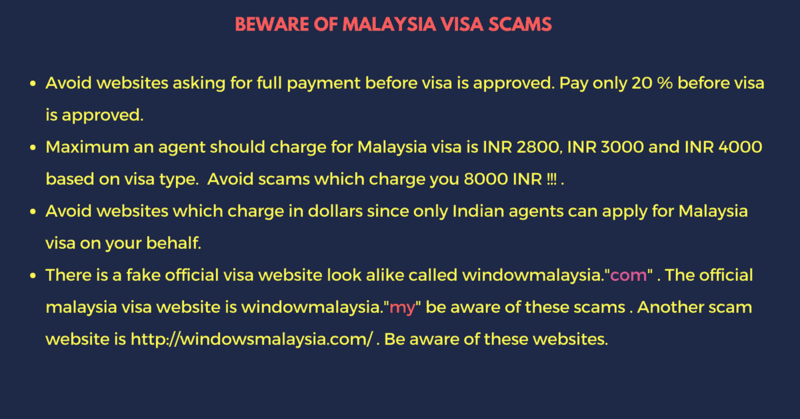 First off, be careful of 10s of websites which are online and promise to get you Malaysia visa and once you have completed the payment, disappear all together. Ideally, make an advance payment of say 10 to 25% before your visa is approved. Once your Malaysia visa is approved, agent will then provide you with your visa identification number which you can verify on the official government website and only then make full payment. Avoid all other websites which will only scam you of our money . Ideally speak to the travel agent and clear your doubts before you apply for visa. How to apply for Malaysia eVisa (Malaysia e visa) online for Indians ? Once you fill the form, you will receive an email we will contact you and gather your details . Please follow the instructions in the email and send us your documents as soon as you can. Malaysia eVisa for Indians (Malaysia e visa ) online fees ? Since 2015, Malaysia government fees which was INR 1000 has been waived off for Malaysia 15 days eVISA as well as Malaysia eNTRI visa for Indians. But VFS fees as well as GST +VAT+ card processing fees are still applicable. See the table below to know the cost of Malaysia visa for Indians. We have added our fee charges as well. What is the benefit of applying for Malaysia e visa from you ? What is Malaysia eVisa for Indians (Malaysia e visa) ? Basically, there are 3 types of Malaysia visa for Indians when applying as a tourist. These visas can be applied online either by yourself or with the help of a Malaysia visa expert. Based on your plans, you can choose the right Malaysia visa. 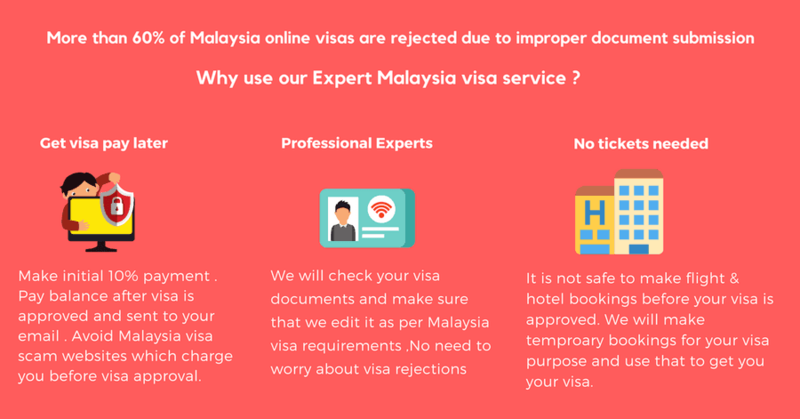 The easiest and the most cost effective visa to get when applying for Malaysia visa is Malaysia eNTRI visa which we can help you get approved within 2 hours where as Malaysia eVisa can take upto 8 working days. Make sure your passport has a validity of at least 6 months. It also needs to have two blank pages for the entry and exit stamps. Your visa application will get rejected if these specifications are not met with. 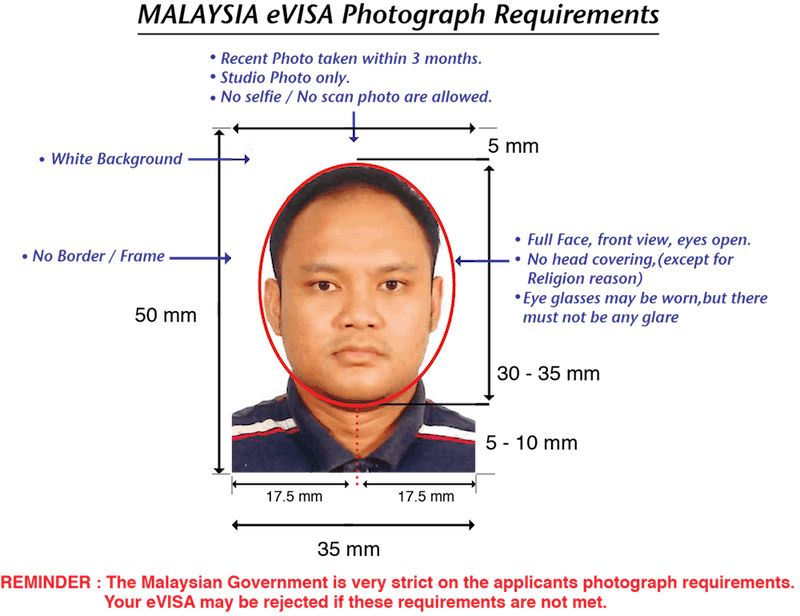 If you are applying for Malaysia visa through us, our graphic designers will ensure the correct specifications. You will need to upload a scanned copy of your passport’s first page. If you have two, scan the first page of the latest one which is valid. This document also needs to be in the PNG or the JPG format. Check the image below to get an idea. A scanned copy of your passport’s last page. The requirements are same as above. 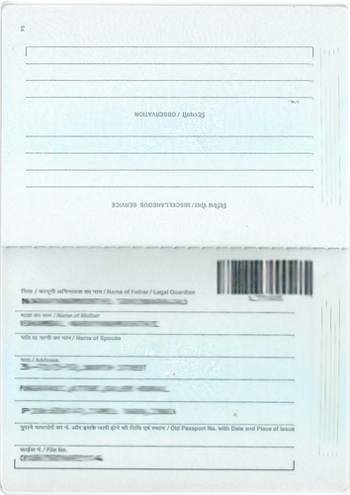 A scanned copy of your passport’s page that shows your last international travel details. Confirmed flight tickets to and from India. This needs to be a PDF document. 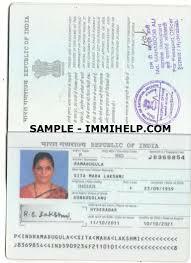 If you do not have this document we can get temporary flight and hotel for your visa purpose. Apply through us and we will arrange for this document. You do not have to worry about losing money in case your visa gets rejected. Confirmed hotel reservations for your entire stay in Malaysia. This also needs to be a PDF format. Let us arrange for this as well. We have trusted travel agencies in Malaysia that will give your hotel confirmation for your entire stay, something that is required for the application of a Malaysia eVISA. You can make your bookings, once your visa gets approved and not risk your own money. 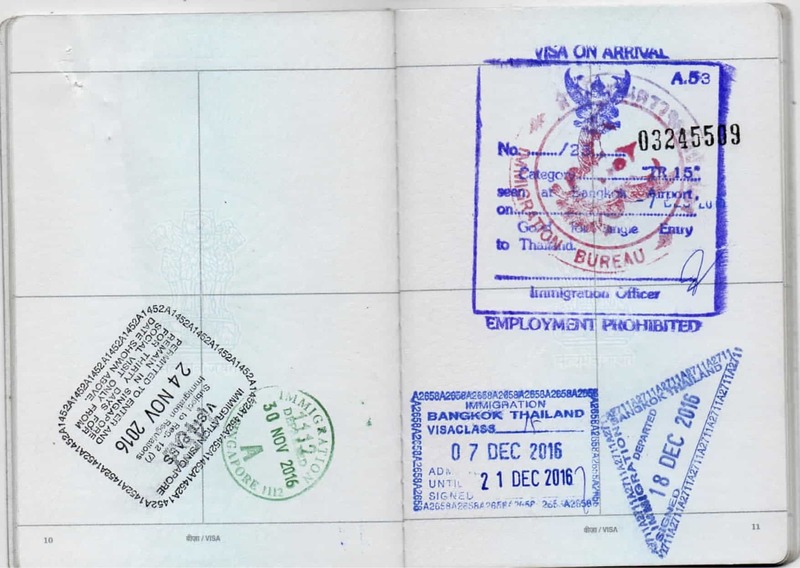 Already hold a valid tourist visa for either Thailand,Singapore or Indonesia. Hold a valid return ticket to India. Have at least USD 1000 with you to show as proof of sustenance during your stay in Malaysia. But is it a good idea to get Malaysia visa on Arrival ? Particularly, when it is cheaper, easier and more safe to get your Malaysia visa before you plan your travel ? Why is it not a good idea to get Malaysia visa on Arrival ? Indians can now get Malaysia eVISA or Malaysia eNTRI visa at the comfort of their home. In fact, we have helped process over 1 lakh Malaysia eVISAs last year. The cost. Malaysian government charges you USD 100 (RM 330) for each visa whereas the cost for normal online visa with us is less than half of that. Single Entry. Once you exit Malaysia, your visa gets expired. But what if you want to extend your trip ? Or visit back next month to soak in the beauty of this wonderful country ? You will need to apply for your eVISA once more. Only 7 days stay allowed. You are allowed to stay in Malaysia only for 7 days. Even the cheapest Malaysia online visa allows you to stay for at least 15 days. Queue. Believe us when we say the queue is huge . You need to wait for at least 2 hours to get your visa since the queue is that long. Hence, make use of visa on arrival in only emergency cases. When should Indian passport holders apply for Malaysia eVISA ? Ideally, Indian citizens who wants to visit Malaysia as a tourist on eVisa would be better off applying for Malaysia eVISA/eNTRI visa at least 15 to 20 days before departure. This will ensure that you have sufficient time to plan your trip and you can be sure that you are visiting Malaysia getting the tension of some unplanned cancellations out. This will also ensure that you have enough time to account for delays in your eVISA processing by the malaysia consulate.But you can apply even one week to 3 days before departure. Since Malaysia eVISA/ eNTRI visa can be got within 2 working days at most. But this is risky and not recommended at all. What is the difference between Malaysia eNTRI visa & Malaysia eVisa ? As this table suggests, the only reason to go for Malaysia eVisa over Malaysia eNTRI visa is when you want to explore Malaysia for more than 15 days . If you are staying for less than 15 days then it is better to go for Malaysia eNTRI visa since it is cheaper by INR 1000 at least. But if your days are not fixed, it is better to apply for Malaysia eVisa. 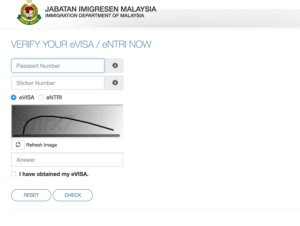 How long does it take to get Malaysia eVisa or Malaysia eNTRI visa from you ? Malaysia eVISA/eNTRI takes 2 working days. The process is influenced by holidays in both India as well as Malaysia. The 2 days is calculated from the day that we acknowledge you that we have applied for your visa. 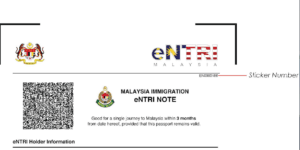 How to verify the status of my Malaysia eVISA or Malaysia eNTRI visa for Indian citizens ? You can verify your visa by visiting the official Malaysia website. Enter your passport number in the first field. In the second field, you will need to enter your sticker number. You can find your sticker number in your electronic visa. If all the information entered is valid, then the website should return record found. I was planning to visit Langkawi and KL. And I just enquired that which visa should I apply for to your customer support agent. Bejoys assisted me with my travel plan. And I filled my application form and submitted documents and initial payment as per the instructions they provided. On the second day after playing I got my visa. You are really good in this. Thanks a lot. Thank you so much I have got my visa within an hour after making my final payment as per the instructions from your customer support agent through email. Also he guided me with further instructions to be made. Thanks a lot it was helpful. Very professional website for Malaysian visa. I was using it for the first time and it was a nice experience for me. Your services was good to go with the consulate; I hope so. Because of your customer support I was able to apply for my Visa. And thus I got my visa approved now. This is my first experience of purchasing visa through online website. I will do recommend your services hands website to the needful. I really did had a pleasant evening with you guys. Your services are really hassle-free and was tension free to. Your service and support was really helpful for me. Thanks a lot for sending the visa on time and I was able to catch my flight on right time with the visa. Thank you so much. You are planning to visit Langkawi Island in Malaysia. And also some remote places of Malaysia in our vacation.. and your Visa services was really hassle-free. Thank you so much for excellent service. I have got my visa approved within 3 days for multiple entry. I think my plan will work out now for visiting Malaysia twice.yeah..thanks..